The Laughlin entertainer magazine has conducted interviews with the Oak Ridge Boys every year the group returns to Laughlin. We often rotate chats between Joe Bonsall and Richard Sterban, and even Duane Allen on one occasion. All of them have been more than accommodating each and every time. However, we hadn’t talked with William Lee Golden at all, thinking he was the strong, silent type, the wise deep-thinker of the group, who preferred his solitude. Well, it isn’t that he doesn’t like to talk, Golden just likes to take his time. So it was pretty cool he agreed to be interviewed for the Oaks’ trip to Laughlin this time — offering up a different perspective. Golden’s “golden” baritone voice still handles those challenging notes with ease, blending perfectly with the other Boys, but he also loves to walk for miles, paint landscapes and take photos. The art feeds his soul as much as the music, and his photos and paintings mark all the places the Boys have roamed over their lifetime of delivering music across the planet. Musically, the Oak Ridge Boys always have been about reinventing themselves to keep up with the times while still respecting their history and those tight harmonies that put them in the spotlight in the first place. Along the way, the Boys have earned respect for their longevity, their work ethic and a body of work that continues to sustain a career that dates back to the 1960s. They have legions of fans, many of whom they know by name and consider personal friends. Their saddest times last year were losing their good friends — country music’s Roy Clark and former President George H.W. Bush (41). The “original” Oak Ridge Quartet vocal group performed gospel in the 1940s, then took the calculated move into the realm of country music during the 1970s. Duane Allen joined the quartet in 1966 as the lead singer, then along with Golden, Bonsall and Sterban, the four of them breathed new life into that old group. They propelled the group further into the pages of musical history even they could not have imagined. During that evolution, they changed their image and their gospel heritage and took on more of a modern pop-country sound. This move was controversial at the time but it proved to be the right one. The Oak Ridge Boys’ four-part harmonies and upbeat songs spawned dozens of country hits such as “Y’all Come Back Saloon,” “American Made,” “Bobbie Sue,” “Dream On,” “Thank God For Kids,” and their mega-hit, “Elvira.” In addition to racking up so many hits, they’ve won just about every music award out there including Grammys, Doves, CMA and ACM trophies. They also made it into the Grand Ole Opry, and into the Country Music Hall of Fame in 2016. Along the way they continue to record, many times stepping out of their comfort zone to slip into different formats and genres. 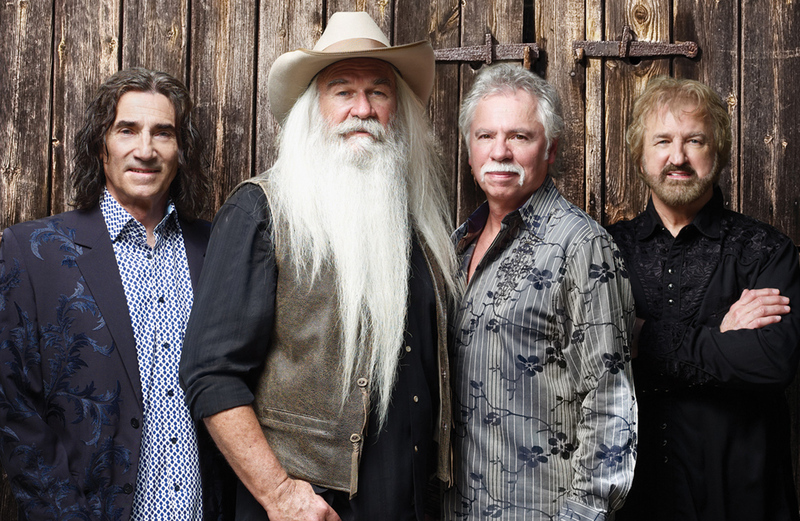 Every year in February, the Oak Ridge Boys make an annual trek to the Riverside Resort for the 11 shows they perform during their seven-day engagement — the only act that ever does that, because their fans are that devoted. William Lee Golden talks about the fans, the music, his art and more. Here’s how our phone conversation with him went…. It’s very cool getting to visit with you this time. I thought you were the quiet one who didn’t do interviews. I am kind of quiet, shy and timid sometimes. I probably get that from my mother, and my daddy was outgoing, but I see both of them in me, so it’s a good blend. Does the art feed the music or does the music feed the art? Well, I think they all intertwine in a way. As we travel and tour and sing, to me, I enjoy getting out of the hotel if it’s a beautiful day. I like to get outside and go somewhere, if there are local landscapes in the area. With Laughlin, you have landscapes on both sides of the river, as well as the river itself. When you’re traveling, it’s just good ’cause you get a feel of where you’re at, and to me, nothing is quite like getting out wherever you’re at on earth. America is one of the most beautiful countries that I could have imagined being in because you’ve got so many different areas of the country that are just breathtakingly beautiful, whether it’s state parks, or national parks and things like that — to have so many opportunities to just photograph our scenery is something I love to do. Talk a bit about photographing and painting the Laughlin area. I used to walk up to the dam there and back every time we’d be there. I’d go up there for a walk every day. I’d get up early sometimes and walk up to the dam up on top, look at the lake and turn around and walk back, that was about a five-mile round trip. I did that for years, then I got to crossing the river, going over to Oatman and up Route 66 and shooting photographs along Route 66 over there. I also like going up on the Nevada side, up the hill there to Grapevine Canyon and around Christmas Tree Pass and the Spirit Mountain area. I’m a slow painter and it’s got to where all of my paintings I’ve done I painted on the road. I take my equipment with me and my canvas on the bus, I’d always have a couple of canvases, and I paint with acrylics because they dry fast. I can paint during the day and pack everything up at the end of the day. I got it to where I carry lights and stuff with me, so I just set an easel up by a window in the hotel room where I have good light, and I sit there and paint using my photos as reference. Sometimes when I’m shooting pictures in the places I’ve been, I get what you would want to be your composition, and then I would zoom in to other things within that composition — get a closer look at it, using a zoom lens also to shoot down at the vegetation around where I’m standing. I get a closer look at it and get plenty of reference material, for when I’m putting painting compositions together. But I’m so slow. It takes me sometimes three, four or five months sometimes to get a painting finished. But I like to paint on bigger canvas, you know, that way, I don’t have to be so tight and precise on everything. It gives me a little more freedom to paint it, so to speak, to tell what it is I’m lookin’ at. I understand you share your travels with fans on social media. On our days off, I use that time on social media, like Facebook, Instagram and Twitter, sharing with people, whoever might be following along. If I photograph an incredible sunset, or a coyote, there are a lot of fans and friends that love to follow along and see where we’re at and where we’re going. Laughlin’s always got a lot of things to see around it. We are. Dave Cobb, who produced that project, came to see our Christmas show. He’s the hottest record producer in Nashville right now. He produces Chris Stapleton — in fact he’s been out playing guitar with him, too. We met Dave about 11 or 12 years ago doing a project with Shooter Jennings, and we did have an album about 12 years ago called “The Boys Are Back” that Dave produced. So we’ve been talking to him and the label wants us to do another album with him. He was at our Christmas show and we do a set change in the show where they roll a big fireplace out there and bring rocking chairs out in front of the fireplace and we sit in the chairs and each guy gets to talk to the audience. We’ll sing a song or part of a song and the next guy might tell a story about his childhood and growing up and what Christmas means to him. Dave saw that particular section in the show, and he said, “Man, I’ve got an idea! I want the next project to be like a front porch scene, like y’all did the rocking chair segment. I want it to be a ‘front porch’ album, where you go back and it takes you back to your childhood and the music that turned us on as kids, other acts, you know?” So we’re kind of pulling stuff like that, and there’s a lot of ideas running with that particular thought pattern. Will you be trying out some upcoming stuff at the Laughlin show? It’s like “17th Avenue Revival,” that we started singing some of those songs and putting them in the show when we were in Laughlin last time. That’s kind of what we do in Laughlin, is songs that we’ve been wanting to bring back to the forefront and put back on stage — because Laughlin is where we like to mix the shows up, where every show is not the same. We have a lot of fans and friends that sit all in the front section there. That’s all sold out and it’s the same people at every show, and so for us to mix our show up, it’s good for us, it’s good for them. So we get deeper into our catalogue in Laughlin. Keeping it real for your fans probably means as much as your music, doesn’t it? I think so. We all know where we come from. We come from cotton farmers and peanut farmers, there was always music around our homes. I was learning to play guitar and sing with my sister who played mandolin. Between the ages of 7 and 10 we’d sing and play country songs, but we’d play in church and my granddaddy’s radio show. We’d sing once a week. We were always going to different churches and singing, then we’d get invited to sing at high school assemblies, fish fries, we’d sing everywhere. What do you do to keep the vocals in tact? I work out everyday. I do six reps of 25 sit-ups, 150 of them. I do not miss a day. That keeps me in shape, breathing deep gives me more wind. It keeps my diaphragm in shape so I don’t have to strain, or get out of shape and struggle. Athletes can’t play the game without staying in shape, so I have to be in shape to sing at the level I have to sing at, because I take pride in what I do. I have to meet standards I set for my own self. I don’t walk as much now that I’ve gotten into sit-ups. It helps me sing better and it makes me feel better. We’re like a team of horses pulling a stagecoach — we push each other. As far as Roy Clark, it was a sad time for us and it still is. Roy meant a lot to the Oak Ridge Boys. Our manager, Jim Halsey, managed Roy throughout his entire career, and they took us under their wing. He put us on a lot of Roy Clark’s shows — we worked Vegas with Roy, he took us around the world in 1976. We spent three weeks in the Soviet Union performing with Roy so it was quite an educational experience and it was also an experience to go behind the iron curtain and see how those people lived. It was like stepping back in time and it made us more thankful for America and being born and raised in this country. I’m glad Duane and I went to see Roy just about a month before he passed away when we were in Tulsa. We heard he wasn’t doing that well, so we went to see him in his home and we sat and talked with him, reminiscing about a lot of things. He was happy and in good spirits. That was a sad time and we were also on tour when we got the word that President Bush passed away. We had made a promise to him and Barbara that we would be there, when the time came because they had asked us to be a part of it. So we were in Spokane, Washington, we did a show there, we arranged to have a private plane that flew us after the concert all night to Houston to get there. We got there at 4:30 a.m., got to the hotel at 5 a.m., got up at 7 a.m. to be ready at 8:30 a.m. to go to the church for the 10 o’clock service. We got to spend some time with the family before the service and afterwards. We’ve been good friends with all of them since the ’80s. From there we went back to the airport, got back on the private plane for us, went to the other airport and flew back to Kennewick, Washington, for the big arena concert that night for the Christmas show. We didn’t miss a date, but we were pushing ourselves, we didn’t get a lot of rest for 24 hours, to keep our promise to our dear friends. Did you ever think the Oaks would still be going this strong after over 50 years? We still do 155 concert dates with a few travel dates in there, too. We’re fortunate and blessed that we get to do what we love, since we were kids playing and singing. The older I get, I appreciate that I still get to do that. To still be around, God’s been good to us. We’re all so thankful and we never get tired of doing it. We are serious about what we love to do.